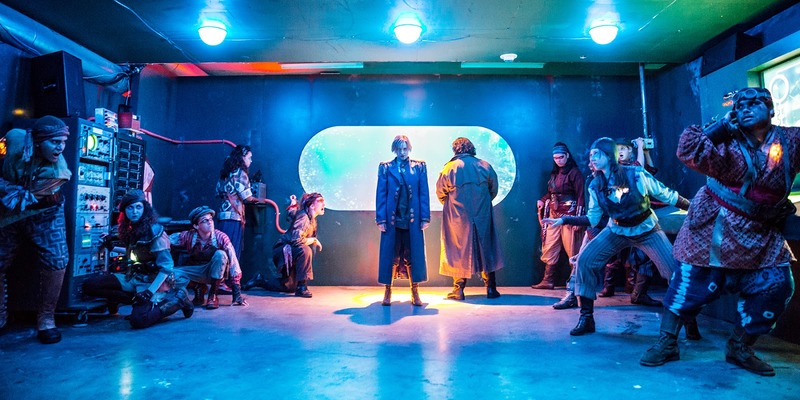 Children's Theatre Company's latest offering 20,000 Leagues Under the Sea isn't what we usually think of as theater. But it is the best game of make-believe ever, and what is theater if not an elaborate game of make-believe? CTC is an expert at playing to their target audience while still creating art that we grown-ups can enjoy as well. And kids are quite familiar with playing make-believe, acting out their favorite stories, TV shows, books, or movies. That's pretty much what this show is - fan fiction (created by the wonderfully inventive team of Ryan Underbakke and Nick Ryan) about Jules Verne's novel with a fantastic team of actors playing the characters and leading the audience, who are also playing characters, through the story. It's an exercise in the collective power of imagination, something that comes naturally to kids, but that's necessary for adults to take part in occasionally as well. 20,000 Leagues Under the Sea is a super cool and totally unique experience. I don't want to tell you too much about the experience, because the uncertainty and surprise is part of the fun. But you should know that you will be required to get physical, running, crouching, doing jumping jacks, as you are led through backrooms, staircases, and hallways of the theater (a great way to see some theater and get in a good workout at the same time!). 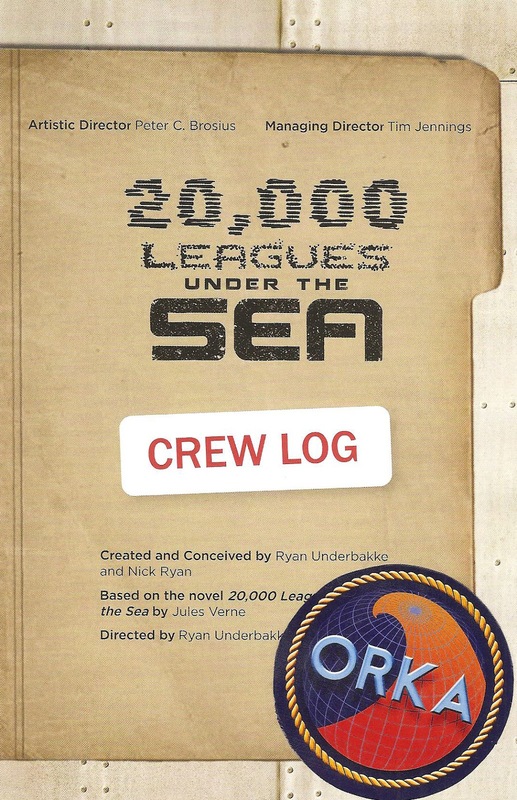 The premise is that the 20 or so audience members on each "launch" (see website for times) are on a mission to capture Captain Nemo aboard her (yes, her) submarine Nautilus and rescue Professor Arronax (having never read the book, I found a quick perusal of the Wiki page to be helpful). You'll be in spaces large and small (claustrophobics beware), dark and bright, with cool electronic equipment that looks like something out of Star Trek, sometimes projecting scenes going on in other rooms. And there's one particularly detailed and homey looking Victorian designed room. The scenic and projection design (by Jorge Cousinea), lighting design (by Craig A. Gottschalk), sound design (by Sean Healey), and costume design (Annie Cady) all combine to create a completely immersive multi-media underwater experience so lifelike I almost wish I had taken Dramamine! The cast and creative team merges CTC veterans with artists from the physical theater/comedy/improv world. The roles of the two mission guides are double cast (likely due to the frequent launch times), and I was happy to be guided by Isabel Nelson (whom I will gladly follow wherever she leads me, underwater or with her lovely and inventive company Transatlantic Love Affair) and Matt Spring (of the hilariously clever Four Humors). Both give performances so committed and real that even though my plan was to let the kids go first, I found myself rushing to the front to follow their commands. Watch for CTC company members Dean Holt as the good (?) professor and a completely transformed (as usual) Reed Sigmund in a scarily convincing performance. Jame Froiland's strong performance as Nemo makes the audience question just what side we're on. And in fact, we're asked to make a choice at the end, like a live action Choose Your Own Adventure book. Immersive walk-through theater is a bit of a trend right now (see the recent Crime and Punishment, and NYC's Sleep No More), and CTC is doing an amazing job bringing it to children, perhaps its most susceptible audience (I heard parents whispering, "don't be scared, it's just pretend"). Part of the fun of the experience is watching the wide-eyed children as a totally in character actor gets down to their level and speaks directly to them (don't worry parents, you're not asked to respond or do anything, just follow along and obey commands). For kids and adults alike, 20,000 Leagues Under the Sea is the awesomenest game of make-believe you've ever experienced (the mission continues through August 23).